Jr Dragster Record Keeper - Peter Sotropa recordkeeperjr@nedra.com. NEDRA NEWS (October 31, 2012) Canadian electric Jr racers, ten-year old Layton Krauss, races his car, Light Switch, against twelve year-old Megan, at the National Hot Rod Association National Open on July 28, 2012. Layton races with car owner Peter Sotropa. The Light Switch crew holds the record holder for the under 13 age group, in the 1/8 mile for a 72 volt electric car. Layton set the record on Sept. 15 and holds the record with a time of 9.91 seconds. This is Layton's first year racing and his opponents mainly drive gas and alcohol dragsters. 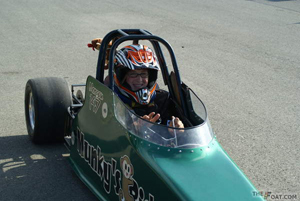 Megan is the driver of the first electric junior dragster in Canada. Her first run was on May 28 2011 at Saskatoon International Raceway. Her best run the lead acid batteries was 11.44 and 58 mph. Her crew put in lithium A123s for 2012 best run was 10.19 fastest speed was 66 mph. Megan's Dad is building a new car for 2013. See the Weyburn Review on Layton Krauss' 2012 season with the JR Dragster. Kids from 8 to 17 year old can enjoy the thrill of racing electric on the drag strip and be recognized as a NEDRA Junior Record Holder. 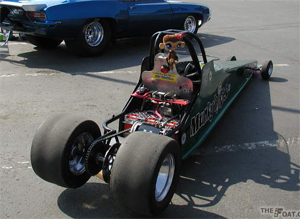 In 2010, the NHRA approved electric powered junior dragsters (EPJDs) to race against gas junior dragsters. NEDRA expects more interest in the sport as a result of the change in the NHRA rules and we are here to help those who are interested in building these vehicles. 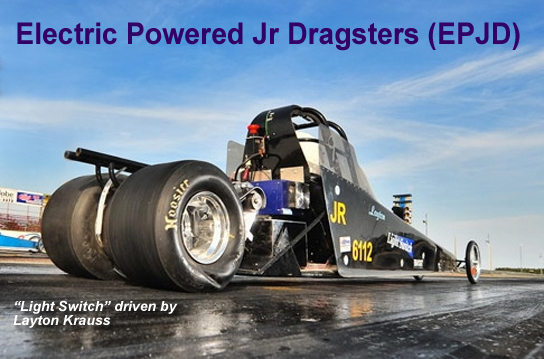 Electric Powered Junior Dragster Class Designation begin with JR/xy. Records will be recorded only up to the legal NHRA limits for the Junior Dragster Class according to age groups. If any time slips are submitted for records quicker than the limit, the record will be recorded as that limit. NEDRA will only keep records for the first three cars to submit time slips at the legal limit and will be duly designated and “1st to reach”, “2nd to reach”, and “3rd to reach” at which time the voltage division record will be permanently retired. It is expected that at some point in the future the higher voltage divisions will be retired as it may be fairly easy to reach those limits at the higher voltages. However it is anticipated that records for the lower voltage divisions will be around for long time to come until limits are reached. Requirements and specifications for Electric Jr. Dragster are the same as those for NHRA CASTROL GTX Jr. Dragster with the following exceptions. All vehicles are restricted to a maximum of one (1) rear mounted electric motor. Motor must be mounted in conventional position. Exposed motors must have a shield of .024-inch steel, .032-inch aluminum or .120-inch Lexan. Minimum weight less driver 225 lbs. Maximum weight less driver with all batteries 400 lbs. Weight greater than 400 lbs. requires SFI chassis specification 2.7. Wet (free liquid) batteries prohibited. All Batteries must be securely mounted outside of and completely sealed from driver compartment. Batteries may not be located above top of drive tires or outside of frame. 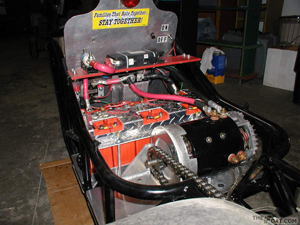 Batteries must be mounted as per requirements listed in current NHRA rulebook section 1F - ELECTRIC POWERED VEHICLE. Traction motor and/or high-current wiring may not be located in drivers compartment. Instrumentation wiring permitted. All traction wiring must be isolated from vehicle chassis. All battery packs must have over-current protection. Circuit breaker or fuses permitted. Devices must have a DC voltage rating equal to or greater than nominal pack voltage. Current rating must be lower than master disconnect, wiring and battery pack can carry without damage. Battery sub-packs must be individually fused. All vehicles must be equipped with a switch, attached to driver with a lanyard, capable of shutting off all power to motor. Switch may actuate relay or contactor. Solid state switch prohibited. A flashing yellow light must be affixed to top of roll cage indicating when electrical system is energized. All vehicles must incorporate a master electrical disconnect switch that disables all electrical functions. Switch must be located on deflector plate no more than three inches from top of roll cage. Must be clearly labeled as to off position. Must disconnect all power from motor. Switch may actuate relay or contactor. Batteries may be recharged in pits or other designated areas only. Polarized plug connection to battery pack from charger mandatory. Maximum permitted operational voltage 144 volts nominal. Voltage checked at battery pack. No load using digital voltmeter. Maximum fully-charged battery pack voltage shall not exceed 156 volts. Refer to current NHRA CASTROL GTX JR. Drag racing League Rulebook and the NHRA Rulebook section 1F for additional requirements or regulations. 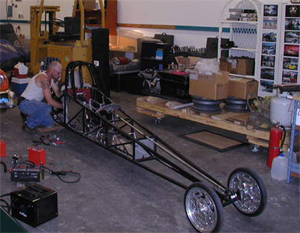 Building an electric junior dragster can be a rewarding experience. The advantages of the juniors are easily apparent. They take off smooth and fast. The motor's torque can provide some impressive 60 foot times. EPJDs don't require a seperate starter and as a result don't need to be towed or pushed to the starting line unless you want to save the battery charge or if the track only allows Jrs to be towed. Just go under your own power. For the lower voltages up to 72 volts consider Alltrax. For all voltages above 72 volts consider the Zilla, Logisystems, Kelly, Raptor and Curtis. An emergency/service circuit breaker is needed for quick disconnects. Heinneman circuit breakers are widely used as well as Albright and Bubba contactors which are big relays that switch on the high power. Only sealed batteries are allowed. Most commonly used are sealed lead acid batteries and lithium. Hawkers are popular among drag racers. Many use 12 volt 16 Ah. Lithium is available. Thundersky's can be bought off the shelf although there is a waiting period. Custom made lithium packs are commonly done today. where pi has been estimated to 3.1415962. Note that diameter can be affected by tire pressure. EPJD with an 18.5 inch diameter tire and motor running 5000 rpm. 15 tooth front sprocket and 72 tooth rear sprocket. Direct drive with no clutch. Please visit our EV Links page for a complete list available info and parts. The pioneers in EPJD racing are Brent Singleton and his father Kent. Brent started out racing gas juniors but saw the potential electric power had and converted their gas jr to electric in the early 2000s. "Jaws Jr" raced all over the western part of the US running 84 mph in the 1/8. It was a challenge. Not building the electric version but being accepted. Electrics weren't permitted to race against the gassers except for a few demonstration runs. 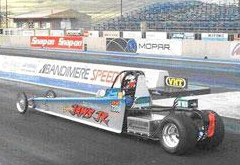 As Brent promoted EPJD racing at the strip, NEDRA members Bill Dube and Roderick Wilde approached the NHRA to have EPJDs added to the Jr. Rulebook. 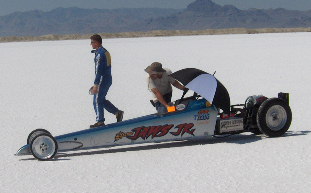 As the challenge continued to get EPJDs accepted Brent and his father took to racing Jaws Jr at the salt flats. They swapped out the jr drag slicks for taller salt flat tires and adjusted the gearing. Today they are advocates for the salt flats and active in promoting electric salt flat racing helping to organize several events each year. Other pioneers in early Jr dragster were "Electric Louie" Finkle. 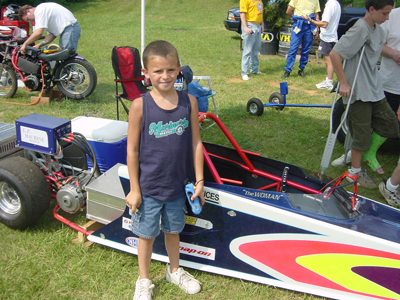 In 1999, Louie converted a Jr. Dragster for the Hendric's family which was driven by Donny Hendrics. The car was 120 volts and could top 85 mph easily. Eric and his wife Tracy Miller built an electric dragster for Tracy and his nephew Eric to race. Since EPJD's weren't allowed to race competitively they found a niche with smaller adults like Tracy. Eric also helped the Singleton's with Jaws Jr.
Today's pioneers include former NEDRA President Shawn Lawless who built an electric Jr, "Orange Blossum" for his daughter to race. Current NEDRA President, Mike Willmon, constructed a Jr called "Munkey" which is the green EPJDs shown on this page.